From the air...3 field designs. Very cool. 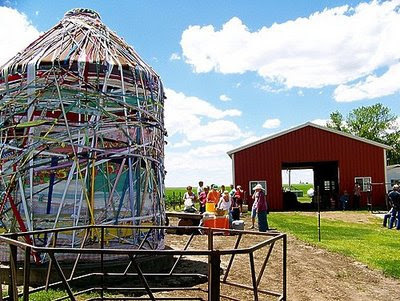 One of the artists wrapped a corn silo. Double cool. Well, no studio time again. And the sad part is, it didn't bother me. Hope this doesn't last too long. However, this past Monday Debbie and I went into the courthouse to finish the last few details of the mural we created with her daughter, Arin (off to Southern Illinois University to pursue another masters in writing), and a whole bunch of young people of all ages. The last of the pictures are still in my camera. Just can't seem to finish anything these days. The mural blog so far is themuralproject2.wordpress.com. When you can, jump to it and see the process. Today, I promise, to finish that blog. really...I mean it. This past Sunday was the final day of The Fields Project also. It's a collaboration of artists and farm families. 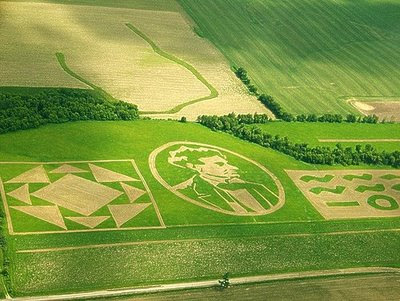 Bringing agriculture and art together...two completely different worlds colliding. It's awesome and has been going on for almost 10 years. One of my favorite artists, Anne Leuck Feldhaus of Chicago, has been a participant for several years. She says it all, both in word and pictures, in THIS POST. Get a cup of coffee, sit back and view her Flickr slideshow.